Craig gave me the chance to be the first road tester for the Encore 100 and Encore 200 microphones from Blue Microphones. Blue is better known for their recording mics and special application mics and now they have entered into the realm of mics for live use with the Encore series. 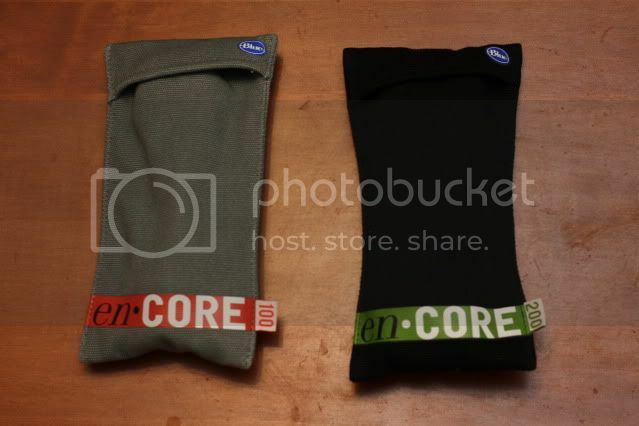 I received one Encore 100 and two of the Encore 200 for this road test. Both are dynamic vocal mics with a cardioid pattern. The Encore 200 needs phantom power while the 100 does not. Just for reference, the Encore 100 sells for around $99 and the Encore 200 sells for around $149 from the major online retail stores. Because of the pricing similar to the Shure SM58 and the fact that I normally use the SM58 for vocals, I will be making comparisons relative to the SM58 for the most part in this review. I have been running sound for a contemporary Christian rock band for the last 6 years or so and that is who I tested these mics with. It's a fairly typical 4 piece rock band (drums, electric guitar, bass, acoustic, and 3 vocals). I typically run around 97-99 dBA at front of house (about 50 feet from stage on average) with peaks from 102-105 dBA. All four band members are on IEMs so I didn't have to worry about interactions with stage monitors for this test. First off, while this may not matter to most people, the pouches that these mics come in are a bit nicer than the standard Shure pouch. It's like a thick tweed material with a soft inside liner. It seems like it may provide a little more protection than the pouches most manufacturers provide with their mics. It's also nice that the pouch has the microphone model on it so you know what's inside the pouch without having to open it to check. 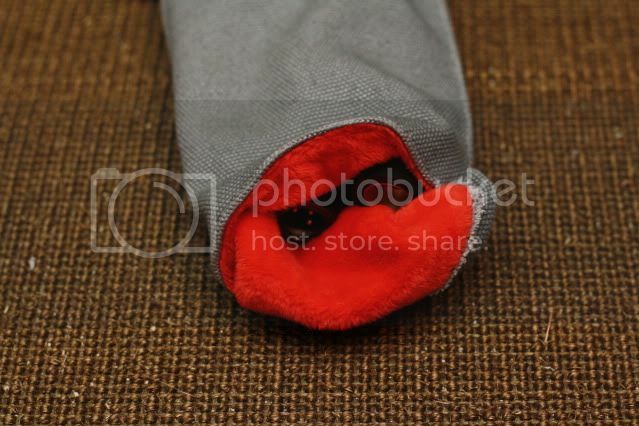 The pouch has a flap that folds open at the end of it rather than a zipper down the long side of it. I carry all my mics in a mic case so the pouch doesn't really matter to me but I thought I would mention it anyway. Another thing that may not matter to everyone but is worth a mention is the mic clips that come with these. They are good sturdy clips that are a little more flexible than the SM58 clips. They are a little more like a wireless mic clip as far as flexibility. I liked the clips myself. They are a little easier to get the mic in and out of than the SM58 clip but still give a good solid grip on the mic. The first thing I noticed when I pulled the mics out of the bags for the first time was the very shiny, reflective grill on both mics and the copper color of the grill on the Encore 200. The Encore 100 is on the left and the grill color is more of a silver/chrome color than the pictures show. The grill looks a little "yellowish" in the pictures because of what it is reflecting from the room. Both mics are perhaps a little shinier than the pictures would suggest also. I certainly wouldn't have chosen such a reflective finish on the grills or the copper color of the Encore 200 grill. My first thought was "will the singers even want to use these mics?" I don't think they are ugly or anything like that but they just stand out a little too much for my taste. 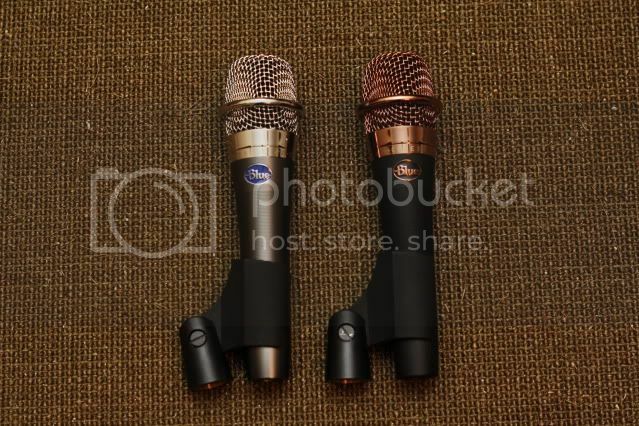 After taking in the appearance of these mics, I noticed that they seem to be very solidly built. They have a good "heavy" feel to them and seem like they could stand up to life on the road. Of course, we're not allowed to torture test items in the road test so I can't say for sure how durable they are but they seem solid. I did have a little trouble getting the XLR cables to lock into these mics, especially on the Encore 200. Sometimes they would lock in but the lock on the connector wouldn't spring up like normal to confirm that they were locked in. It was only after I tugged on the cable a bit that I was sure they were locked in. That was a bit of an annoyance for me but not a deal breaker by any means. I started off my comparison by setting up the whole band as normal with SM58's on all vocalists. I wanted to hear the SM58 in that particular room with that particular setup just to get a baseline for comparison. I wanted to hear a direct A/B comparison of the SM58 and the Encore 100 with the same rig, same room, exact same setup. So after listening to my lead vocalist through an SM58 for a little bit, I swapped him over to the Encore 100. I just swapped the mic and didn't touch the channel EQ or change anything else at all. My first impression of the Encore 100 was that it sounded noticeably richer and fuller and just sounded more natural than the SM58. It also seemed a tiny bit hotter level wise than the SM58. Even my singer thought from behind the PA that it was a noticeable difference in the house mix and he also thought it sounded better in his IEMs. We were doing a multi-day event so I left him on the Encore 100 for the first night so that I could listen to it through a normal set. The more time he spent singing through the mic, the more I was able to observe about it. One thing that I noticed was that the handling noise seemed to be much more than an SM58. The mic was in a stand the whole time but if he stepped heavily on the stage in front of the mic stand or clipped a capo onto the stand between songs I could definitely hear it in the house. On the positive side, the Encore 100 seemed to exhibit less of a proximity effect than the SM58. Normally when my lead singer sings a really low passage he has to get real close to the mic and push his vocal to give me enough level to get him up over the rest of the mix. What normally happens on a 58 is that the low end in his vocal becomes muddy and the overall vocal isn't as clear. However, when he would get real close with the Encore 100 I didn't experience the low end muddiness that I am used to. His low vocal parts came through much clearer and more intelligible than I am used to. Since I wanted to leave the Encore 100 on the lead vocalist for the night, and since I had two Encore 200's and two background vocalists, I tried the Encore 200's on the BGV's. When I sound-checked the first BGV with the Encore 200, my first impression was that it sounded better than the SM58 he was just on but I quickly realized I didn't have enough gain before feedback for it to be usable. Remember that I'm not using stage monitors so this was feedback from the house that I was getting. I tried it on the other BGV just to see if it was any different for him but had the same issue. Of course, the BGV's are stage left and stage right putting them closer to the mains than my lead vocalist who is center stage so I thought I might still be able to use it for lead vocal. Just for kicks, I tried the Encore 200 on electric guitar. The Encore 200 sounded very dull compared to the Sennheiser e609 that I had just replaced. I'm assuming it was the high SPL coming from the guitar amp that was causing it to not perform so well. No amount of EQ seemed to help it either. I was running the e609 nearly flat as I know where to mic the amp to get a great sound out of it. I quickly realized the Encore 200 wasn't going to cut it for electric guitar and switched back to the e609. The next night I tried the Encore 200 on my lead singer in place of the Encore 100 he had used the night before. I listened to him again on the Encore 100 for a little bit to refresh my ears on how it sounded and then switched him over to the 200. The only thing I changed besides swapping the mics was turning on the phantom power for the Encore 200. I could tell a difference in the sound of the two. I wouldn't necessarily say that one sound was better than the other, just different. The Encore 200 sounded very good just as the Encore 100 did, but the 200 had less low end and a little more "sparkle" in the highs. I thought it sounded a little more airy than the 100. The Encore 200 reminded me of a Shure Beta 87A. The gain before feedback of the Encore 200 was better with my lead singer than it was on the BGV's but it still wasn't as good as the Encore 100. However, it was usable so I kept my lead singer on it for the set. The Encore 200 exhibited the same handling noise as the 100 and it also exhibited the reduced proximity effect of the 100. Really, the little bit of difference in sound quality was the only noticeable difference I could tell between the 100 and 200. And again, I wouldn't say that one necessarily sounded better than the other. They were just a little different. I was able to use the Encore 100 on one of my BGV's and get enough gain before feedback to make it usable. I would say the GBF was comparable to an SM58. And again with this particular vocalist, I felt like the sound quality was an improvement over the SM58. Another thing I noticed about the two Encore mics was when my lead singer delivered some more powerful passages. He has a pretty strong voice in the middle to upper part of his vocal range. The Encore 100 seemed to handle the higher SPL's more gracefully than the Encore 200. My lead vocalist can get a little shrill in the 5K-6K range at times on an SM58. On the Encore 100, this didn't seem to be as bad as the 58. But on the Encore 200 it seemed to be as bad as, if not worse than, a 58. However, the response curves on Blue's website and the identical Max SPL ratings of the 100 and 200 would suggest that these mics should perform about the same in that particular area so maybe there is another reason behind what I observed. My lead singer said after using both of these mics, "these mics just make it easier to sing." When I probed for what he meant by that, he basically said that he felt like he didn't have to work as hard to get the nuances in his vocal parts to come through. This was something he sensed in the house mix when he had his IEM's out and something he sensed in his IEM's as well. I think he felt like what came out of the house system and the IEM's was a more direct reflection of what was going into the mic. I would have to agree with him based on what I was hearing. 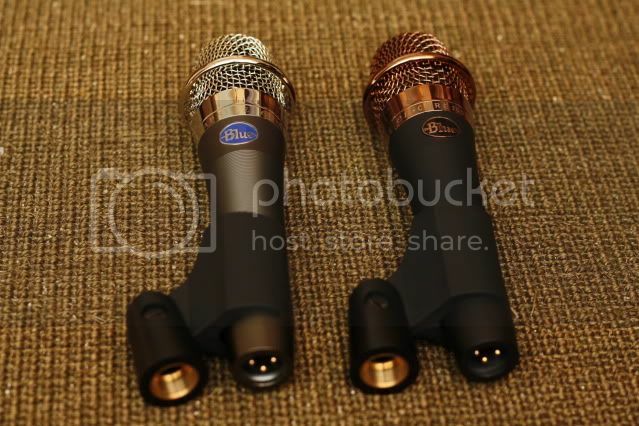 After my experiences with these microphones, I will definitely consider a purchase of these mics. They both offer great sound quality but come with some negatives. At the prices you can get these for, they are definitely worth considering versus similarly priced offerings from other manufacturers. I would probably recommend the Encore 100 for louder shows where a lot of gain before feedback is needed. The Encore 200 seems to me to be a better fit for acoustic shows or anything where you don't need as much GBF. I would definitely recommend both of these be used in stands rather than being held by a performer. Below are the pros and cons based on my experience and my personal opinions. The cons of the Encore 100 are things I can live with. I'll always have them in a stand and my guys would know to be more careful when touching the stands or clipping the capo on the stand during a show. The appearance is just a preference issue that isn't a deal breaker if it means I get better sound. We will probably end up buying a few of the 100's for the band. I haven't tried the Encore 100 in a live setting yet... I tried one through our "demo" PA at the shop, though, and the first thing I noticed was the handling noise. I have demoed them, and the handling noise was a top negative here too. The e200 sounds good on snare though. These look a lot like the Heil PR20/22, and seem to have similar characteristics (at least the 100 model) in terms of higher handling noise. I'm not a fan of the shiny grills, but at the reasonable price these may do alright. It's certainly a tough market though. It seems that everybody makes a mic these days that is supposed to be "better" than a 58. Of course better is a subjective thing, or else the 58 would have been retired long ago. It seems that everybody makes a mic these days that is supposed to be "better" than a 58. Of course better is a subjective thing, or else the 58 would have been retired long ago. Exactly right Jeff. For me, the Encore mics did some things "better" than the 58. But some things were worse. It's just a matter of whether the good outweighs the bad. In my particular application the "bad" for these mics is something that is manageable. at the reasonable price these may do alright. The price of these is one of the first things that caught my attention. If the Encore 100 had been $200 or maybe even $150, then I may be saying no thanks. But I've seen it as low as $79 with free shipping from two of Blue's listed online resellers (as low as $63 from a reputable online seller who is not listed on Blue's website). That's a very attractive price point to help the good outweigh the bad. Anybody else want to test them? Thanks for a thorough review Dan! I know what you mean about the copper looking grill. I showed the mic to a few folks and about 1/2 think it looks cool (me included) and about 1/2 do not like the look. I may buy one just for my collection because of the different looking grill. If anybody else would like to get a chance to use the 3 mics, shoot me a PM here and I can set that up. Re: Anybody else want to test them? I've gone back and forth on how I feel about the appearance (even a little bit since writing my review). I do appreciate the fact that they tried to do something different instead of copying the appearance of the competitors' mics. I guess I feel like when looking at them outside of the context of the stage they look good. They just "sparkle" a little too much on stage. I don't want the microphone to distract from the performance. And I don't want to have to deal with any resistance from the musos because of the appearance. The silver color of the Encore 100 seems a little safer with the musos in my opinion.